Today was a hell of a day for CLOUD. Wayne started bending cloud-like dimples into our metal substructure – which, up until this point, has resembled a canoe, and now actually looks like a cloud. We bulbed a small sample piece of chicken wire and draped it over the structure to get a feel for the aesthetic. Burnt out light bulbs are so beautiful – their colour varies so much (gray, brownish, white, light gray, silver, etc). It would be a total dream to cover CLOUD entirely with burnt out bulbs… and even though we’ve only managed to collect about 400 bulbs of 5,000 (in part thanks to a soon-to-be-donation of several hundred burnt out light bulbs from FORT CALGARY of all places!) there’s still hope that we can make this aesthetic happen. 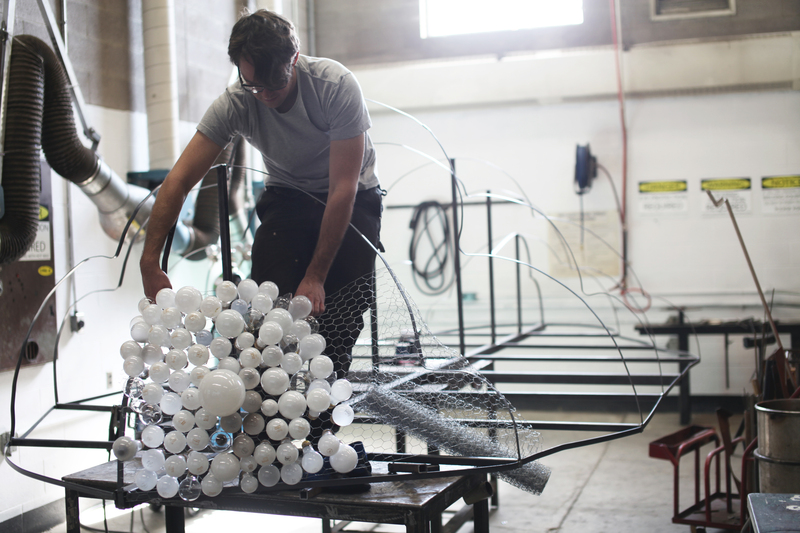 Wayne Garrett draping a sample piece of CLOUD skin over the steel internal skeleton of the sculpture. In other news, something pretty cool happened in the world of CLOUD this evening. About a week ago, we were short-listed for the Awesome Foundation’s monthly $1,000 Pitch Night. Essentially, you submit an idea (via their website) and if they think it’s awesome enough, you do a 90 second verbal pitch, and, if that’s awesome enough, you get $1,000 in a paper bag, no strings attached. Anyway, I’ve been an honourable mention three times. But this time, Wayne and I managed to make the finals. After a late afternoon of welding, we just managed to scramble to the venue on time (fastest shower ever!!!) and, after some adieu and absolutely no practice, we found ourselves standing in front of a tight group of people at the AREA, talking about light bulbs and community collaboration and re-appropriating materials post-function. Any-hoo, we’re $1,000 richer. Which means this: it’s time to spread the word. We’re putting an ad in a mainstream newspaper calling for Burnt Out Light Bulbs. It’s the fastest way I can think of to get in touch with TONS of burnt-out bulbs… and that, for a couple reasons, would be really awesome. Thanks for the $$$, Awesome Foundation. Filled with gratitude.